These 'Stories of Hope' are a rolling testimony to the difference people who care can make in the lives of people who need to know what hope looks like. Aesop (620 - 564 BC) said "No act of kindness, no matter how small, is ever wasted" . At TFCM we have already seen many acts of kindness (both small and large) shown to children and families in Uganda. Every one of these kindnesses has impacted the lives of the receivers, as well as enriched the lives of many of the givers in some way. We are so happy to share the stories contained in these pages. The generosity of TFCM supporters since our start-up in 2008 gives us confidence that many more stories have still to be recorded and celebrated here. Here are some of the numerous ways TFCM is working in Uganda to make a difference ... one life at a time. We found the family living in one room which was smaller than the average one car garage in the U.K. Joyce had been recently widowed at the age of 26, following her husband’s murder on his way home from an evening shift as a ‘Boda Boda’ (motor bike taxi) driver. There is no mains water, electricity or sewage disposal in the numerous slum areas of the Ugandan capital city. This family’s room was virtually empty of household essentials and was dominated in one corner by a large pile of charcoal. This turned out to be the only source of a meagre income for the family, stored at home and sold locally whenever Joyce could compete successfully with the many other charcoal sellers. The pile of charcoal was covered with a sheet and it was on the pile that the family sat and slept. One month after we first met her......ready to start at Happy Hours Primary, Kawempe. Topista yearned to go to school and she became the very first child to be sponsored through TFCM. Topista worked hard at her studies throughout primary school and in 2013 she successfully completed her primary leaving exams. We held a party in Uganda for her and six of her sponsored friends in February 2014, the week before they moved up together to secondary school. In November 2017 Topista completed her first four years at secondary school and is awaiting the results of the Uganda Certificate of Education exams. It has been such a privilege to support Topista and see her grow into a determined young lady with hopes and dreams for the future. Thanks to her own determination to succeed, and with the support and encouragement of her sponsors, teachers and the TFCM team in Kawempe, she will be helped to make a decision on how her career will develop after the secondary school exam results are known. From 2018, Topista will have choices to help shape her future! But that’s another story of hope yet to be told in these pages. This is Eve, Henry and William who finished at The Father's Children School in December. They now move onto their secondary schooling, and this was their enrolment day at their new school. We wish them all the best and would like to thank the TFCM sponsor and other supporters for giving them a better start in life, something that every child deserves. 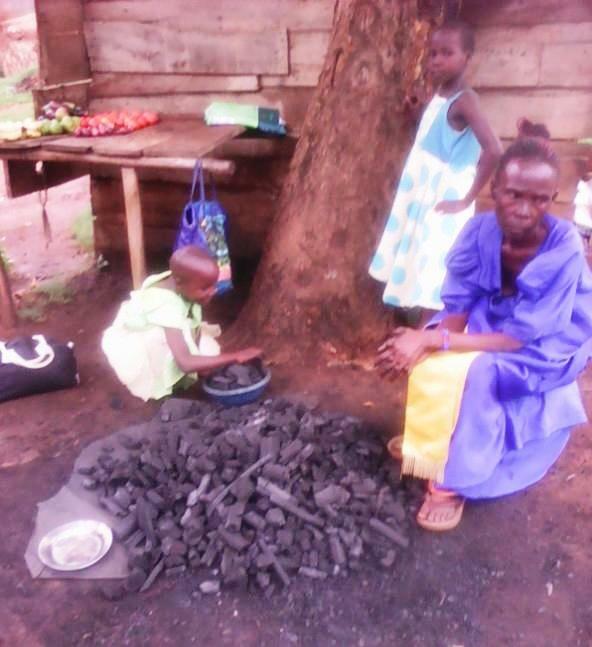 Making and selling charcoal brings in very little for Robina. This is Robina Namagembe. She is a widow, 70 years old, and most of her children have died from HIV/AIDS, leaving her, alone, to care for a number of grandchildren. She has been gradually worn down. With the children too young to work, her only source of income has been from making charcoal and selling it locally - hard work for very little reward - enough for one very basic meal a day, and little left over for new clothes let alone schooling for her precious grandchildren. Hope for the future. Robina receives her first donation from TFCM. Robina has recently become sponsored within the befriend a granny scheme. Her youngest two orphan granddaughters are both now supported at school through the Buddy Builders Club. With the support we can give her, there is hope that things will be a little easier. With the two children supported through the BBC they have hope for the future: Alice is in Primary Class 4 and Olivia is in Primary Class 5. They are kitted out with uniform, and given a meal each day at school. Support from her befriender allows Robina to buy more nourishing food and some basics for her home. The difference? You can see the hope on Robina’s face! Hope and encouragement comes in many forms. For the children and family guardians below, being supported through TFCM, brings hope, which looks like something tangible and makes a real difference. Celebrations at the TFCM training centre: our first BBC group being sent to school. 16 children from 8 families, supported by 16 overseas sponsors. BBC is designed to give hope and practical support to needy and marginalised families who face a daily struggle to meet even the most basic of family needs. The club provides schooling for two children from the same family, neither of whom has had the opportunity to attend school regularly. A support connection is established between the two children (the Ugandan buddies) and two buddies from outside Uganda who choose to make a real difference in the life of that family. The Buddy Builders Club is different from sponsoring a single child for schooling. It makes double the impact through the combined commitment of the two external buddies, who can either be members of the same family, or good friends... The success of the BBC is built on the close relationships already established on both sides of the partnership. In every case, the Ugandan buddies from the same family attend the same school together, even though they will be in different classes, unless they are twins....and we have a few of those! Importantly, BBC is also designed to give the sponsoring buddies the option to connect with the family guardian as well as the Ugandan buddies they are supporting. To encourage and show interest in the guardian brings them hope - they know that there are two people from overseas who care about the family situation, and are prepared to give much valued support.